4-H claims its Africa program benefits kids — but is it also creating a market for genetically modified corn? Francis Baah didn't always want to be a farmer. As a little kid growing up in a village outside the small city of Koforidua, Ghana, he watched his father toil in the fields all day to grow corn that his mother bundled to sell at the market. And even after all that hard work, there wasn't always enough money to send Francis and his four siblings to school. But that changed the year Francis turned 16. A teacher at his school was starting a new club called 4-H. It was all about farming, and despite his misgivings, Francis decided to join — he made a point of participating in school clubs. To his surprise, he loved it. The club members learned new farming methods and were introduced to a special kind of corn seed called Pioneer, which would yield a bigger harvest than the seed that local farmers were using. The club leaders even gave them some of the seed for free. That year there was very little rain, and Francis's father's crop was disappointing. But the 4-H club's corn not only thrived — it was delicious, sweeter than what Francis's parents grew. The schoolchildren sold it at the local market, and they got to use some of the money for snacks and activities. Club leaders told Francis and his classmates that with these new techniques and seeds it was possible to make a good living as a farmer. Francis showed his parents the money he had made from 4-H gardens, and that, rather than scattering seeds on the ground, he'd learned to plant the reddish-pink Pioneer ones a set distance apart from one another, with just one or two per hole so that the plants' roots didn't get too crowded. He also showed them the club's vegetable garden. Francis's dad was especially interested in this new Pioneer seed, so Francis asked the 4-H leader if he could have some. The next time a representative came, he brought extra seed for Francis. However, unlike many bygone rural institutions — one-room schoolhouses, barn raisings, Rural Free Delivery — the club, now part of the Department of Agriculture and still administered through land-grant universities, has managed to reinvent itself. It has expanded in both scope (adding science and engineering to its old standbys of agriculture and animal husbandry) and size: Today, 4-H boasts 7 million members in more than 50 countries. In the last two years, 4-H has made a major push to ramp up its programs in Africa. The reason is simple, says Jill Bramble, National 4-H Council's senior vice president and chief development officer: “Many African countries have an agriculture strategy, but very few are thinking about young people,” she says. They should be: “The farmer that is going to feed the world in 2050 when we have 9 billion people is 14 years old today.” So far, 4-H efforts to promote American-style agriculture across Africa have been hailed as a success. 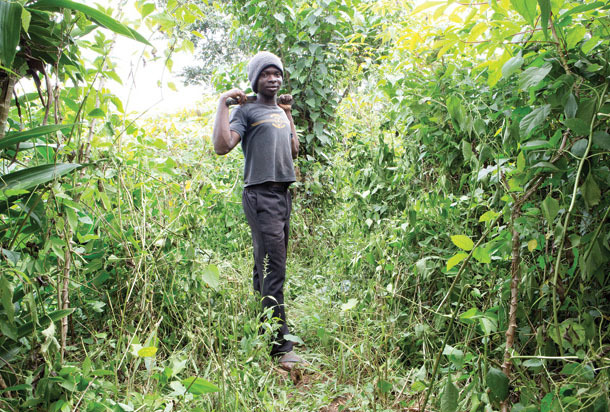 Some clubs have used money from selling their crops to pay for school fees and uniforms, and adults have used the new techniques for their own farms. But starting new clubs on another continent costs money, and that's where things get more complicated: The program's main sponsor is the US-based chemical and technology behemoth DuPont, whose yearly revenue surpasses $34 billion, thanks in no small part to its sales of agricultural products. The seed for the DuPont/4-H collaboration comes from its subsidiary DuPont Pioneer, the world's second-largest producer of hybrid seeds and a major supplier of genetically modified seeds. In Africa, where the need to produce more food is especially urgent, DuPont Pioneer has made major investments — most recently, in 2013, it bought 80 percent of Pannar, Africa's largest seed company. The company, spokeswoman Lori Captain told me, aims to “engage youth all over the world to help address food security.” With its agricultural tradition and vast global network, 4-H was well suited to help. Yet DuPont has found a very willing partner in 4-H. “We want 11- and 12-year-olds to gain an appreciation for agriculture as a possible career and a business opportunity,” says Shingi Nyamwanza, who heads 4-H's programs in Africa. “DuPont is making that possible.” The program started as a small pilot in Tanzania in 2010, and in 2012, it expanded it to Ghana, where 3,500 children, ages 6-19, enrolled. In 2014, 4-H and DuPont have rolled out school gardens in Ethiopia, Kenya, and South Africa. In May 2013, I went to see Francis Baah's club for myself. After a long, bumpy ride in a shared van — or trotro — Stephen Koranteng, a 4-H program director in the city of Koforidua, signals to the driver, who lets us off by the side of the highway. We walk a few hundred yards past a collection of open-air cement structures packed with middle schoolers. Despite the blazing midmorning sun and the heavy humidity, the kids are goofing around rowdily before class begins. The 4-H club leader, a 26-year-old science teacher named Charity, rounds up the members of the club and claps her hands. A tall, thin teenager with a serious expression stands. His school uniform — an orange short-sleeved collared shirt tucked into long, brown shorts — looks freshly pressed. He offers to show me his club's corn plot. I follow him and a few other club members down a dusty red-dirt road that cuts through a thick palm jungle alive with the hum of insects and the squawks of birds. Francis and I discuss school, which he loves. He lights up when he talks about his dream of studying agriculture at university. He's 18, but he still has three more years of school to go — it's common for kids here to drop out for a few years to help at home and come back when there's enough time and money. We turn off the road onto a dirt path that leads to a one-acre plot of rows of corn. The plants are about as high as my waist, and the club expects another big harvest. But even if the club sells all of its corn at market, the profit won't be enough to buy seed for the next year. Francis worries about this; no one has told him whether 4-H will continue giving out free seed after this season. Next we set off to see Francis's family's farm. We walk past the kitchen — a cloth tarp shading pots and a fire ring with embers giving off an enticing, smoky scent. Francis finds his dad, drenched in sweat from working in his fields. He greets us warmly. With Francis and Steve translating from the local language of Twi, Francis's dad tells me that he liked the Pioneer seed that the 4-H club gave him much better than the local kind — a variety developed by Ghanaian crop scientists in the early '90s calledobatanpa, or “good nursing mother.” Like Pioneer, obatanpa is high in protein and the essential amino acids lysine and tryptophan. But Francis's dad says the new seed was more productive and tasted better. On the van ride back, I ask Steve what's next for farmers like Francis' dad. Back in Koforidua, we stop at Steve's office, three small rooms packed with about a dozen employees, above a little stall that sells water, soda, and biscuits. Steve finishes up some work, and then we head out for some dinner at an open-air restaurant with plastic tables and chairs. Steve, 26, has lived in Koforidua his whole life. At night he lays his head in the modest apartment he rents for about $35 a month. In addition to 4-H, he runs a call-in youth radio program and works on his screenplay, a romantic comedy that he hopes to sell to some producers in Nigeria. His favorite movie is Let It Shine, a 2012 straight-to-TV Disney film with a Cyrano de Bergerac-type plot. He loves hamburgers and banku, a Ghanaian staple made of fermented corn dough. We order it, and Steve shows me how to dip little balls of the pungent, Play-Doh-like mass in a bowl of spicy, soupy sauce. He explains that banku and a similar dish called kenke are one reason that corn is such an important crop in Ghana — everyone who can afford to eats fermented corn dough a few times a week. Steve polishes off two mounds. I make it through about half of one — the tang makes me pucker. A chatty guy in his mid-20s named Welbeck brings us down a dirt road to their farm. Welbeck's wife, who's wearing a 4-H shirt, and two young daughters sit in the shade of a tree. I wave, and the older girl smiles, then hides behind her mom. 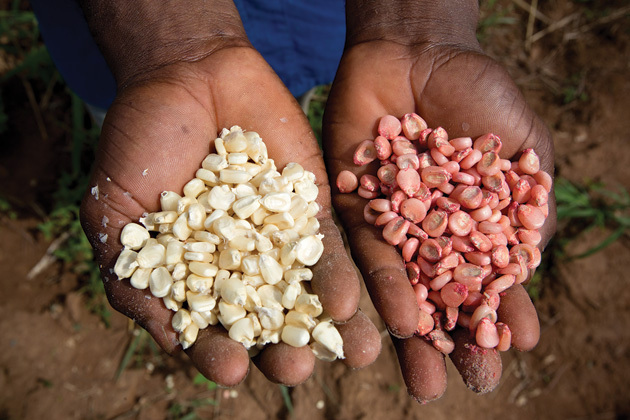 Ghanaian corn seeds (left) and Pioneer seeds (right). Photo: Peter DiCampo. During the last growing season, Welbeck tried out the Pioneer seeds that the 4-H office gave him and was impressed with the results. Like Francis, he noticed that the Pioneer corn was tastier than the local kind — it had fewer fibers to get stuck in your teeth. And at harvest time, the Pioneer seeds' yield was much bigger. Another problem, says Welbeck, is weeds. 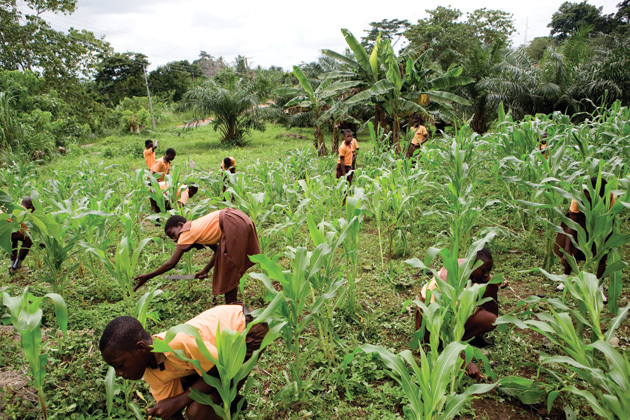 4-H's Ghana curriculum for small school gardens discourages the use of herbicides and instructs students to weed by hand, use compost for fertilizer, and deploy garlic and mineral oil to deter bugs. But when adult farmers expand their plots — a necessity if they ever want to make enough money to buy Pioneer seeds — the natural techniques don't work so well. The backbreaking job of weeding the 10-acre plot entirely by hand overwhelmed Welbeck and his club, so they turned to a more familiar method. He shows me an empty plastic bottle a few yards away from where his daughters are playing in the dirt. It's a generic version of Roundup, the best-selling Monsanto weed-killer. It works great, he says, but it's expensive, and 4-H does not subsidize the price. Add that to the price of synthetic fertilizer, farming equipment, and storage space, he says, and the costs become overwhelming. Welbeck walks us back out to the road to wait for a van. He tells us that his dream is to farm a bigger plot of land so his girls can have a better life. I ask whether he thinks he'll be able to do this. One day during my visit, an agricultural ministry representative named Francis Nii Clottey stops by the 4-H office in Koforidua. He calls the 4-H school gardens a success: The kids have learned that farming can be fun and rewarding, and they've been able to supplement their diet with fresh fruits and vegetables. They've taught their parents tricks to improve their home gardens. He estimates that more than 200 local farmers have adopted 4-H methods. But Clottey is not so sure about the Pioneer corn. In his district, after a school 4-H club had a field day and showed off its Pioneer corn plot, 50 local farmers signed up to buy Pioneer seed. Only six could afford it. He and his colleagues are trying to persuade the government to subsidize the cost of the corn, but he's not wild about the idea of local farmers having to buy seed each year from an American corporation. “To some extent it worries me that we will have to rely on DuPont over and over” — for seeds, fertilizer, herbicide, equipment. But Pedro Sanchez, director of the Agriculture and Food Security Center at Columbia University's Earth Institute, told me subsidies are probably the only way new farming methods can make it in Ghana. He worked with the Malawian government when it introduced hybrid corn in 2005, offering farmers a discount of up to 70 percent on seeds and fertilizer. Within a few years, the country had tripled its yields. For the first time in recent history, farmers actually had a surplus of corn instead of a shortfall. But nine years in, Malawian farmers are still dependent on government subsidies for both seeds and fertilizer — and foreign funding is now drying up. And there are other drawbacks, too: As farmers scale up their operations, it will be hard to regulate the amount of fertilizer they use — just as it was in the United States, where runoff has harmed streams and drinking water and created vast oceanic dead zones. This article is excerpted from Kiera Butler's new book Raise: What 4-H Teaches Seven Million Kids and How Its Lessons Could Change Food and Farming Forever, for which she received grants from the Fund for Environmental Journalism, the Fund for Investigative Journalism. It was reported in partnership with The Investigative Fund at The Nation Institute, now known as Type Investigations, with support from the H.D. Lloyd Fund for Investigative Journalism. Kiera Butler is a senior editor at Mother Jones who writes and edits stories about the environment, nutrition, health, and agriculture.